The photochemistry of organic compounds (e.g. nitrosamines, imidazoles, carbonyl compounds) and carboxylate metal complexes (e.g. 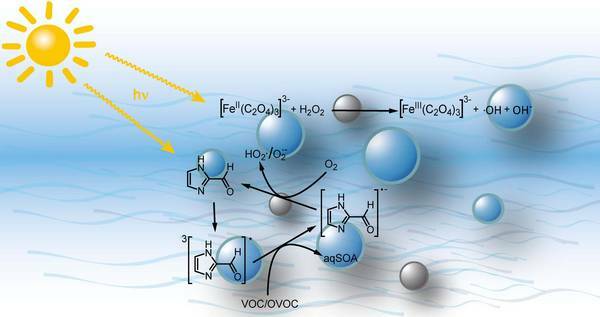 iron oxalate complexes) plays a central role in the degradation of organic compounds in the tropospheric aqueous phase (cloud droplets and deliquescent particles). The resulting transient radical species affect the tropospheric oxidation budget and with it, the transformation processes of chemical compounds, which can lead to aqueous secondary organic aerosol (aqSOA), as well as the redox cycle of the metals. In order to characterize the impact of such processes and to reproduce it in models, fundamental laboratory investigations regarding the photochemistry are carried out using laser flash photolysis, lamp photolysis and analytical methods. Particulate phase chemistry of organic compounds and iron oxalate complexes leading to transient radical species. Weller C., Horn S., Herrmann H. (2013a) Effects of Fe(III)-concentration, speciation, excitation-wavelength and light intensity on the quantum yield of iron(III)-oxalato complex photolysis. Journal of Photochemistry and Photobiology A: Chemistry 255, 41-49, doi: doi.org/10.1016/j.jphotochem.2013.01.014. Weller C., Horn S., Herrmann H. (2013b) Photolysis of Fe(III) carboxylato complexes: Fe(II) quantum yields and reaction mechanisms. Journal of Photochemistry and Photobiology A: Chemistry 268, 24-36, doi: doi.org/10.1016/j.jphotochem.2013.06.022. Weller C., Tilgner A., Bräuer P., Herrmann H. (2014) Modeling the Impact of Iron–Carboxylate Photochemistry on Radical Budget and Carboxylate Degradation in Cloud Droplets and Particles. Environmental Science & Technology 48 (10), 5652-5659, doi: 10.1021/es4056643.